The Akhil Bharatiya Karyakari Mandal commenced today, 23rd October 2016 at 8:30 am at Sree Vidya Vihar, Annojiguda, Bhagyanagar (Hyderabad ) with the Jyoti Prajwalan by Pujaniya Sarsanghachalak Dr. Mohanji Bhagwat and Sarkaryavaha Shri Bhayyaji Joshi. Later, RSS Sah Sarkaryavah, Sri Bhagaiah ji briefed the media as follows. The ABKM meetings review the progress of Sangh work related to various dimensions of society. ABKM will discuss on issues related to Dharmic, cultural awareness, building family values, integrated village development & other social issues. In addition to the review of the organizational growth, ABKM will discuss regarding key issues concerning the Hindu society and nation. The intolerant communists, especially the CPM cadre in Kerala, under the leadership of the Chief Minister have been indulging in politically motivated murders of Hindus esp RSS and BJP karyakartas. Global economic crisis, global warming and animosity among nations is a concern for well-meaning people all over the world. They are searching for a solution for this. This year is the birth centenary of Pt.Deendayal Upadhyaya. He propounded the philosophy of “Ekatma Manava Darashan” or Integral Humanism based on Bharatiya philosophical foundations. This year we would be marking the 51st year of this philosophy. Ekatma Manava Darshan gives a global view of sustainable development, sustainable consumption and humane treatment of nature. 3. Attacks on Hindus in W.Bengal during Durga Puja by Jehadi elements would be discussed. Muslims have been involved in molestation and killings of Hindu girls, many of them belonging to SC/ST community . This is with the the blessings of Trinamul Congress in W.Bengal. It is significant that the High court of Kolkata admonished the state government by stating “ Don’t pamper and appease minority community at the cost of fundamental rights of the Hindus”. 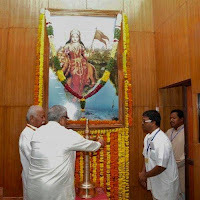 Sangh believes that discrimination on the basis of caste ( jaati ) is anti-human, unconstitutional and does not have sanction of the Hindu Shastras. To address social issues the Sangh has conducted extensive surveys. The survey covered if all Hindus have access to common cremation ground, temple entry and access to common water bodies. Swayamsevaks are actively involved in solving these issues, wherever they come across them. For eg : in Palamoor Zilla in Telangana, with the active involvement of swayamsevaks and ABVP karyakartas, the two-glasses system on the basis of caste has been removed in most villages. The Sangh is commited to ensure that the marginalised sections of Hindu society, esp the SC/ST receive the grants that are committed to them by the government. Sangh is actively working with other organisations who are working toward empowerment of SC’s and ST’s. ABKM paid homages to the social leaders who departed recently from March. ABKM paid tribute Shri Raman (Chennai), who served for decades and was Prant Vyavastha Pramuk of Uttar Tamilnadu.